Stable, dividend-paying stocks may not be as exciting as their more volatile non-dividend cousins, but there's a reason world-class investors like Warren Buffett love them. Source: ^SPXTR data by YCharts. 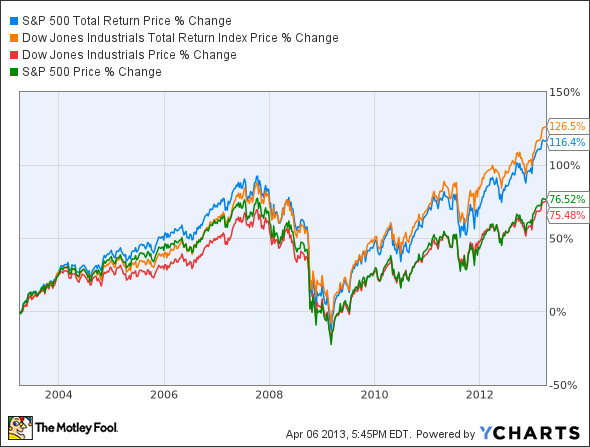 Of course, even without dividends, the indexes still turned in a respectable performance. However, the inclusion of dividends added a whopping 51% and 40% to the Dow and S&P 500's returns over the past 10 years, respectively. Despite trading near 52-week-highs, I'm convinced toy maker Hasbro has what it takes to keep shareholders happy for decades. In addition to being the name behind such perennial hit games as Magic: The Gathering, Twister, Monopoly, and Battleship, Hasbro is also poised to benefit by creating merchandise for every blockbuster movie from entertainment giant Disney, so you can bet it was happy when Disney announced plans for multiple new Star Wars movies following its acquisition of Lucasfilm late last year. In the meantime, Hasbro can look forward to renewed sales from next year's new installment of the Transformers movie franchise, and long-term investors can rest easy collecting a solid 3.7% dividend. If you're looking for another durable long-term business, look no further than garbage disposal and recycling expert Waste Management . As the owner of 283 active landfills, 17 waste-to-energy plants, 131 recycling plants, 95 landfill gas projects, and six independent power production plants, Waste Management is North America's largest recycling and waste services provider and boasts an enviable moat, which many investors believe is second only to Coca-Cola. While the stock doesn't look particularly cheap at nearly 22 times trailing earnings, its 3.8% dividend should help in the long run. Last but not least, thanks to the initiation of its inaugural dividend late last year, I'm happy I can now include in the list of my favorite dividend stocks. After all, the graphics chip specialist currently trades for less than 14 times trailing earnings and had a jaw-dropping $3.73 billion in cash on its balance sheet at the end of its most recent quarter. This, for those of you keeping track, represents nearly half NVIDIA's entire market capitalization. NVIDIA has been incredibly busy lately, building a moat of its own as it strives to become a one-stop shop for all things graphics processing. In addition, its recently announced Tegra 4i is poised to give competing mobile chips from the likes of Qualcomm a run for their money. If NVIDIA can steal any meaningful market share from Qualcomm in the mobile segment alone, it's a safe bet that patient, long-term investors will be richly rewarded as both the share price and dividend continue to increase. Even so, while NVIDIA was ahead of the curve launching its mobile Tegra processor, investing gains haven't followed as expected as the company has struggled to gain momentum in the smartphone market. The Motley Fool's brand-new premium report examines NVIDIA's stumbling blocks, but also homes in on opportunities that many investors are overlooking. We'll help you sort fact from fiction to determine whether NVIDIA is a buy at today's prices. Simply click here now to unlock your copy of this comprehensive report. The article 3 Solid Dividend Stocks for the Long Haul originally appeared on Fool.com. Fool contributor Steve Symington owns shares of NVIDIA. The Motley Fool recommends Coca-Cola, Hasbro, NVIDIA, Walt Disney, and Waste Management. It owns shares of Hasbro, Qualcomm, Walt Disney, and Waste Management. Try any of our Foolish newsletter services free for 30 days. We Fools may not all hold the same opinions, but we all believe that considering a diverse range of insights makes us better investors. The Motley Fool has a disclosure policy.